Germany’s animal husbandry sector has managed to reduce the amount of antibiotics used. Key has been a ‘strategy of minimising and optimising’. Antibiotics usage in Germany’s animal husbandry sector is gradually going in the right direction. This means: downward. That was shown by results of permanent monitoring of antibiotics usage by the German Federal Office of Consumer Protection and Food Safety (BVL). This office is reporting the total usage in animal husbandry, in combination with the frequency of treatments. Every 6 months, new frequency figures become available. Recently, the new figures became available for the last 6 months of 2015. Also in broiler and turkey production similar trends could be observed. 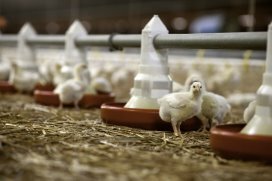 Broilers were given antibiotics on average over 22 times, compared to 27 times in the first 6 months of 2015. In turkeys, the frequency dropped from over 40 to over 32. Two benchmark figures emerged. First of all, a treatment frequency goal, which is met by 75% of all pig farms. Piglets up to 30 kg were treated on average 13.57 times – a reduction of over 7 treatments in comparison to the first 6 months of 2015. In finisher production, the frequency dropped from 6.5 to 4.6 times. The other benchmark figure is a frequency goal which is met by 50% of all farms. Here also the development is positive over all animal species. The reduction of antibiotics in livestock production is an inevitability. The question is now how and when it will be achieved and to what extent. What is clear is that there can be no shortcuts in this process. The German Farmers’ Association (DBV) said that the development is the result of a strategy of ‘minimising and optimising’. This strategy needs further application, the association said, although there is some disgruntlement about the data quality and the starting point of the monitoring. It has become clear that frequency figures miss a certain level of exactness of the usage. For instance, it is difficult to figure out which types of antibiotics have been used. The frequency figure is being calculated on the basis of vets, who need to report every 6 months how many animals they treated with antibiotics. In addition, they are required to report how long these treatments took. Also the types of antibiotics need to be recorded, but these are not expressed in the final figures. For all data, a central reporting office has been set up. The BVL multiplies the number of treated animals with the number of treatment days and divides the result by the average amount of animals on these farms in these 6 months. Individual farms that exceed the benchmark of 50%, are requested to contact their veterinarians to discuss how to lower their usage. Despite question marks about the accuracy of these figures, it looks like the sector eventually has managed to reduce antibiotics consumption. It remains to be seen how much lower this can get.